All transactions are safe and secure with a reliable history in online purchasing behind each of our associates. Buy the Motley Lue t-shirt to own Hot Tub Time Machine clothing and merchandise. Lou made his dreams come true when he was given his second chance. Rather than going back to the present day, he opted to stay in the past and live the dream. He was able to make money by creating the search engine Loogle and he was in the band Motley Lue. I loved the film ending with Lou as the lead singer of Motley Lue in the Home Sweet Home music video. 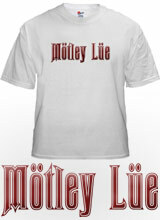 If you felt the same way about the movie ending on a high note, snag this Hot Tub Time Machine Motley Lue t-shirt. I'm on my way...I'm on my way...home sweet home! Here it on the Hot Tub Time Machine soundtrack. In addition to the Motley Lue tee above, browse the Hot Tub Time Machine Clothing Gallery for more apparel like men's and women's clothes, kids shirts or hoodies.